These cookies pack a sweet and spicy punch. If bakery and commercial ginger snaps seem bland to you, then give this recipe a try. This is a "double" recipe, but don't worry about overdoing it. These cookies freeze well sealed in ziplock bags, and they also keep well backpacking due to a very low moisture content. Melt the butter using a double boiler until just melted, but not hot. Let the dough cool in the refrigerator for 30+ minutes, as it will be easier to work with, and this will also help to bring out the spice flavors. While the dough cools, preheat the oven to 350 degrees and put silicone mats on your baking pans, or use a light coating of cooking oil. Make dough balls of about 2 tablespoons and roll them in the white sugar before putting on the baking pan. 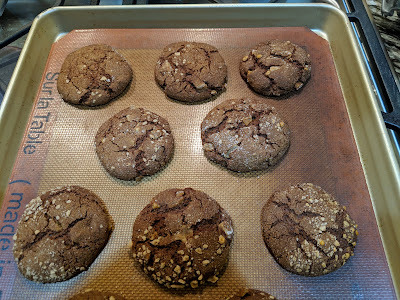 Immediately transfer to a wire rack to finish cooling for a ginger snap, or cool five minutes on the pan and then transfer to a wire rack for a slightly chewier cookie. Blackstrap molasses has a more bitter flavor than regular molasses. If you have regular molasses on hand, you could adapt by slightly reducing the sugar. King Arthur Flour works well for this recipe. For an extra treat, press the dough into baking brittle chips before placing on the pan. These cookies normally come out with a cracked top, but if you put two pans in at once, the lower pan may come out with a smooth top. To correct this, put the lower pan in first, and follow with the top pan after 4-5 minutes.